Generally this is an Add-in issue that is sporadic and unlikely to be reliably repeatable. 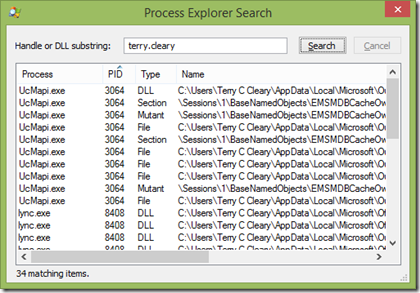 There are lots of ideas and pages on how to resolve and here is another – use process explorer to see what is opening that file and try and close the file / find out what service can be terminated. NOTE – The original problem came about with an OST lock and the simplest option would be to terminate processes (Lync in this instance) rather than close handles – just faster and cleaner. 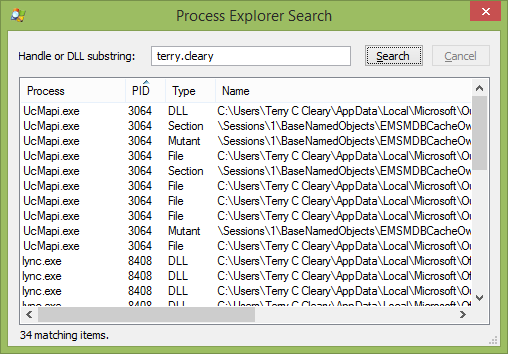 However process explorer is an excellent way to locate locked files so I’ve added the steps for process explorer in more detail using Lync as the example. 2. Launch as administrator (required to close handles). Search for the file using the ‘Find Handle or DLL’ and entering the file name of the locked file. 3. Click on the process that includes the type ‘File’ / ‘Handle’ (in this case Lync.exe) and the main windows will navigate to the process. highlight this (my version of PE does not require the search windows to be closed). This entry was posted in My Pensieve and tagged MyPensieve on September 9, 2015 by TC.